The last time I submitted a photo of Wilson and Wentworth, there was a major collision and traffic was down to one lane. The photo illustrated that there was no gridlock, not even a delay. There wasn't any traffic at all. The photo was taken at 11:00 AM and a reader jokingly criticized me of being a hippie with no job. I'm retired but the point was taken. Today at 4:10 PM (rush hour as I remember), I cycled King Street East from the Delta to Wellington. There is resurfacing on King at the Delta and traffic was down to one lane. Were there delays? Yes, for maybe a minute. Once past the major construction, there were other minor work crews along the way, dropping the available lanes down to two. There was not one instance of delay. The only time traffic came to a stop was for a traffic light or when a transport truck had all of the lanes blocked. That people continue to say that two-way streets will cause delay and gridlock. That sections of this road have been recently resurfaced and more is being done as I write this but no bike lanes or pedestrian improvements are being added. It is clear to me that this area would be perfect for improvements for pedestrians and cyclists and would have little or no affect on drivers. Everybody wins! Sadly, I assume that this is not going to happen, based on the sections of King that have been recently resurfaced with no consideration given to anything other than the car. Fret not: The road lifecycle means that even recently resurfaced streets will be up for consideration in another 20 years. Try crossing on foot at king east an steven, not gridlock but you may wait for two cycles of lights. A compelling argument for Open Streets Hamilton to leave its comfort zone. Re: dimensions. Let's assume King is 40 feet wide right now. Curb parking is 6 feet, then two 10-foot travel lanes, then 6 foot parking lane, leaving room for a 3-foot painted buffer and 5-foot one-way bike lane. Amazing that public works is still rolling along like it's 1950. This was a perfect chance to simply repaint the street from the Delta to Wellington and bring it up to modern standards with a protected bike lane and parking on both sides. Instead we go back to the Industrial heyday design of 4 freeway lanes and timed lights. Here's basically how it could have looked in real life, except the bike lane would be 1-way westbound, not 2-ways. Anyone else want to chip in and buy some more white paint for public works so they can re-do this simple job?? You've also got about 30 signallized intersections between Gage and Dundurn, so traffic lights will be part of the no-frills entry-level conversion cost. Converting just the Delta-to-Wellington strip would involve around a dozen signallized intersections, so that would be cheaper. Of course, until the LRT/BRT issue is fully resolved (or until such time as council removes King from consideration as a routing corridor), this is all somewhat academic. The city's rapid transit plans involve streetscape/infrastructure improvements. They just won't be here until 2020-ish. Thx for the feedback on my complete streets ideas above. Just to clarify, I'm not suggesting we convert it to two-way. Traffic signals wouldn't be impacted at all with my plan. As far as space goes, the above cross section is suggested under the assumption that King is currently 40 feet wide. 4, ten foot traffic lanes. My parking/bike lane idea above fits onto a 40 foot street. The ODD time a turning lane is needed ( they usually aren't) it can be accommodated by losing the last few parking spaces before an intersection. 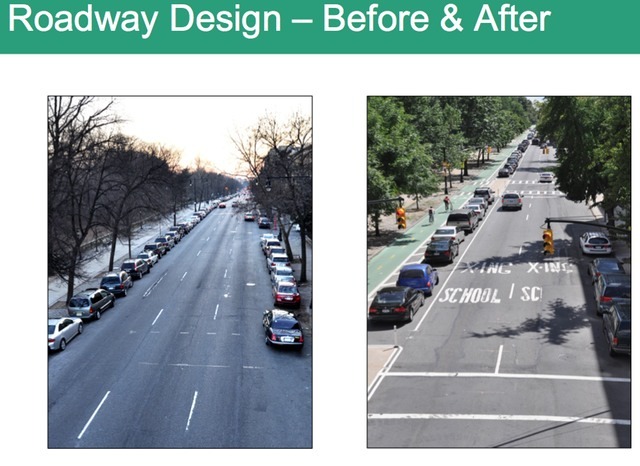 The illustration was just to illustrate the 2 lanes with parking and a protected bike lane. 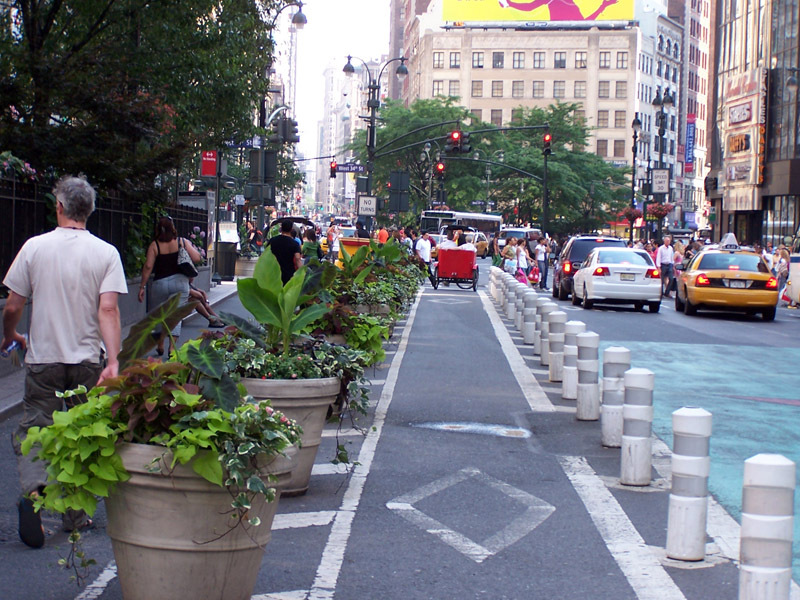 We don't have room for the boulevards, nor would we need lanes that wide. Re: dimensions. Let's assume King is 40 feet wide right now. Curb parking is 6 feet, then two 10-foot travel lanes, then 6 foot parking lane, leaving room for a 3-foot painted buffer and 5-foot one-way bike lane. If by chance King is less than 40 feet we can narrow the bike lanes and buffer zone a bit, or remove parking on one-side. If King is say, 38 feet, we can gain that two feet by shaving off 6 inches from each travel lane and 1 foot from the bike lane. King Street just east of Sherman is 40' (I measured it), which I believe is the narrowest point. The biggest issue I see is on garbage day, not an insurmountable issue, but still an issue. With only 1 drive lane in each direction, a garbage truck would impede traffic without a safe "get around". I'm sure some creative thought could rectify the issue. again to clarify my suggestion above, I'm not suggesting we convert the street to two-way. Leave it one-way with 2 full travel lanes and the parking/bike lanes. This plan would only require paint from city hall (and an understanding beyond 1950 of what city streets are for). No traffic lights would be impacted or anything. Just repaint the street as a complete street. Wow. Fantastic. Thanks for doing that! Good to hear. Yes it sure seems like the narrowest point. So, no reason why we can't repaint the street this summer and bring a massive improvement to every neighbourhood and business along the entire route without causing traffic problems. It's a win-win. Here's a rough idea of what it could look like. This street was too narrow for curb parking on the left side, but you get the drift. We should all be thoroughly embarrassed at how much further ahead NYC is than us with bike infrastructure and complete streets. We have zero traffic issues. They have tons. Yet they are leading. great stuff. With the 2 feet of space leftover on your plan we could make the bike lane 4' and buffer 2'. 6 and 6.5 foot parking dimensions are used in downtown Toronto now as they make room for wider sidewalks, bike lanes etc.... I'm surprised to learn that a car is 6 feet. I can lay sideways across my car and have my feet stick out the other end, and I'm 5'10" Also, 9 and a half foot travel lanes are very common in cities. In fact, I think we have some in Hamilton already. So, at any rate, there is room to tinker with the final design. I'm not sure dedicated bus lanes on King are the way to go. I'd like to see contra-flow bus lanes on Main Street. Of course there is still 'talk' of LRT from city hall, but I think we need to move ahead and stop holding up the entire city for a plan being opposed at city hall and probably with no chance of happening due to no leadership. Unless Hamiltonians suddenly start voting for vision, which I don't see happening anytime soon.